Chocolate Donuts Really Do Cure Coughs! 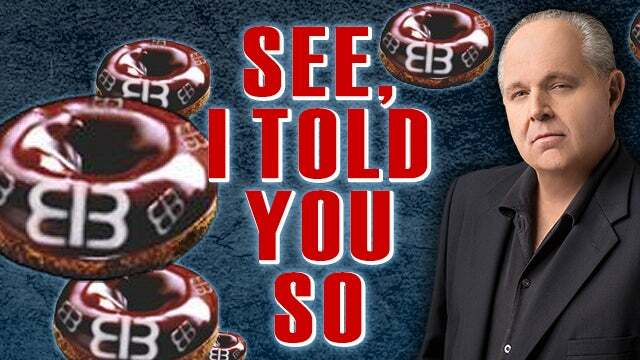 RUSH: Do you remember back during periods of time in the past where I've been hoarse or had a hacking cough and I would always incredulously claim that chocolate cake doughnuts revived my voice? Even if it was just for a few minutes, maybe a half hour, and also seemed to alleviate symptoms of a cold, like coughing and so forth. Everybody thought that was making all that up as an excuse to have chocolate cake doughnuts. Folks, I don't need an excuse to do anything I want. I'm an adult grown man. There's nobody that can tell me "don't eat that." And yet I was accused of making it up as an excuse. Well, look at this. Headline: "Chocolate Is A Better Fix For Your Cough Than Medicine," according to a study. “If your throat is getting scratchy, you might be better off reaching for a Hersey bar over cough syrup. At least that’s what one leading expert is advising — as he says that chocolate is better for a cough and respiratory problems than standard medicine. “Professor Alyn Morice, head of cardiovascular and respiratory studies at the University of Hull in Yorkshire, England, and a founding member of the International Society for the Study of Cough.” Did you know that there was such thing? You know, when I hear about people with jobs like this I always wonder when they were kids and their parents and grandparents, "So, little Alyn, what do you want to be when you grow up?" "Well, I want to found the study of cough." That's what this guy does. Founding member, International Society for the Study of Cough. And he says that chocolate can calm coughs, and he claims that the supporting evidence is actually as solid as a Hershey bar, which is a solid thing, as opposed to being a bunch of squishy mush. And the story is in the U.K. Daily Mail. I can tell you right now that there's something to this. Not just doing something to get rid of vocal scratchiness, but also alleviating symptoms of a cold and a cough.